• London’s bicycle hire scheme is up and running. The scheme was launched at the end of July and boasts 5,000 bikes which can be found at 315 docking stations. More than 21,000 people signed up in the first weeks and some of the early popular hire sites included Soho Square, Drury Lane in Covent Garden and Wardour Street. The bikes are available 24 hours a day, seven days a week. Members of the scheme must be 18 years old and you must be at least 14 years old to ride the bikes. A membership key costs £3 while the membership itself costs at £1 for a 24-hour membership, £5 for seven days and £45 for an annual membership. The first 30 minutes of any journey is then free (with fees applicable after that). As the bikes don’t come with a lock, it’s expected people will simply make a journey to another docking station before getting off. 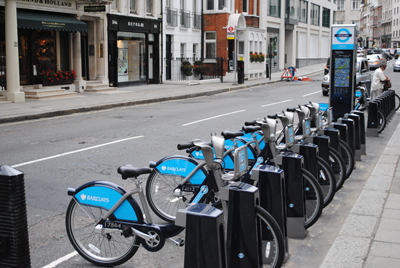 For more information on the Barclay’s Cycle Hire scheme, see Transport for London’s website at www.tfl.gov.uk. Meanwhile, in other transport news, the first air-conditioned Tube train is now in active service on the Metropolitan Line. • The Tower of London was the most visited royal site in Britain last year, attracting 2.4 million tourists, according to a report from VisitBritain. The tourism agency found that while overseas tourists spent some £4.6 billion while in the UK last year, more than £500 million was spent on tourism associated with the Royal Family. The top 10 most visited sites included several royal attractions – Edinburgh Castle came in at number six with 1.2 million visitors, Windsor Castle at number seven with 987,000 and Buckingham Palace at number 11 with 402,000. Other top London sites included the National Maritime Museum in Greenwich (#2 – 2.4 million), the Victoria and Albert Museum in South Kensington (#3 – 2.3 million), St Paul’s Cathedral (#4 – 1.8 million), Westminster Abbey (#5 – 1.4 million) and Hampton Court Palace (#9 – 541,646).